Is it December yet? Ah, I can't wait! In the Schulte house, our stockings are hung by the chimney with care and my Nana's poinsettia mugs are in the morning coffee rotation. By and large, the decorations are up and the heirlooms are out. But not the centerpiece. Not the tree. Our 2018 tree is out there somewhere. Well, not just anywhere. A very specific, very non-romantic somewhere. Namely: The Menards parking lot. Once the lights are on and twinkling, though, our tree's home improvement store roots will be a distant memory. Each Christmas tree's special glow has a way of reaching through time and connecting generations in a single luminous experience. Without further ado, here's Johanna's special TINSEL-filled tale of her family's Christmas tree tradition. Or should I say traditions? Enjoy! What I didn’t realize as a child is that part of the magic behind the most wonderful time of the year is fitting it all in. Why is it that planning the holidays can feel like assembling a 10,000 piece puzzle of snow? I hope that I am managing to give my kids a Christmas where they feel joy and love and not like they are over scheduled. I hope that they have enough time to reflect on the true meaning of Christmas and spend less time thinking about what must-have gadget to put at the top of their Christmas lists. 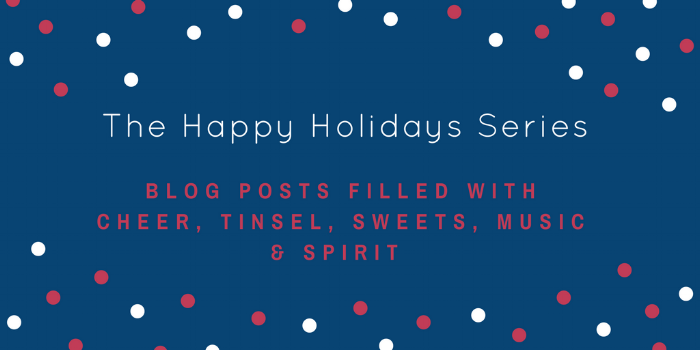 One way that I try to make that happen is by focusing on Christmas traditions that hold special meaning and bridge to Christmas’ past. This is most apparent as we decorate our Christmas tree. Now, I love to decorate and the Christmas holiday is no exception. We decorate four trees in our house.First, we have an all-kids tree in the playroom that my kids decorate all on their own. This tree is filled with their handmade ornaments and big colorful baubles in their favorite colors. No lie - it’s pretty hideous, but if you’re under four feet tall, it’s dreamy. Pink and purple ribbons and blue and green sparkles pop off of this all white tree. It’s a little candyland-esque, but a big hit with my crew, all under eight. We also have a Christmas tree in the basement media room where we spend weekends relaxing watching football and hosting family movie nights. I didn’t have a tree in that space for a long time, but found that after I’d spent a week decorating my house for Christmas, when I actually sat down to enjoy it, I was in the only room without a tree. I can’t say that my husband was thrilled with the introduction of tree number four, but he knows by now that it just all comes with the Johanna territory. Our media room has a rustic feel with a lot of reclaimed wood and a concrete bar top. To fit with this feel, I decorate this tree with big antlers, wide burlap ribbon and just small touches of gold to make it a little more “rustic glam” than “hunting lodge." One of my favorite trees is the Christmas card tree. I string a few pieces of garland and some ribbon and when the Christmas cards start rolling in, I hang them on the tree with small wooden clothes pins. The cards are so beautiful and filled with the people we love, so hanging them for display on the tree this way just seems perfect. 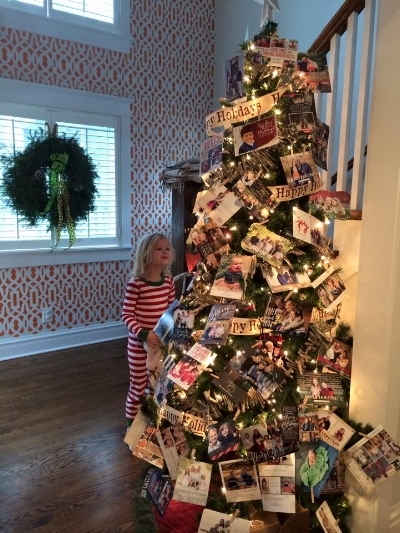 Our kids especially love hanging their friends' cards on the tree and pointing them out all season long. Even with all of these fun trees, my most favorite tree by far, is the Christmas tree in our front living room. When it comes to this tree, I’m definitely reminiscent of Clark Griswold from National Lampoons Christmas Vacation. We buy a real tree every year, and we love searching for just the right one. I love for it to be as big as my space can absolutely handle, and my husband usually has to remind me that the trees looks smaller on the lot than it will in a corner of our living room. We used to cut it down ourselves, but then some angel opened a lot right on the corner by our house with beautiful freshly cut trees, so we began walking to that lot with our wagon. After it is set up in the house, I load on tons and tons of Christmas lights to the tree. My secret is to not just wrap them along the outside of the tree, but rather really tuck them into the tree and then wrap them from the inside out. I usually blow a few fuses, but once all of the the lights are on, it's pretty enough to leave just as is, but what comes next is the best part. On this tree, we put family ornaments. These are ornaments that the kids have gotten each year as they have grown, an ornament that Jason and I got commemorating our first Christmas, or special ornaments given to us by loved ones. We also have an ornament from each trip that we have been on, and we have ornaments that were mine as a child. I keep these ornaments in specific bins, and opening them each year is like opening a gift. This tree is filled with memories. And glitter. So much glitter. This process lasts for hours and I can’t say that the kids always hang in there for the whole time. We are far from perfect, and I try to get ahead of inevitable sibling squabbles by giving each child the same number of ornaments they get to hang on their own. There are very special ornaments that we always hang together - a tiny wooden crèche given to me by my mom, a small angel, a glass bone emblazoned with the name of our first family dog. When we are done, our tree tells a story. Of the time we spent together picking it out and the laughs shared while putting it up. (“I think just a touch to the left. Now the right. And maybe a half inch back, too.”) But also of all of the Christmases we have spent together and of the people we have spent them with. Our tree tells the story of us building our family. From the “First Christmas Together” heart to the pink baby carriage and then eventually another and finally a blue baby booty. It tells the story of people who are no longer in our lives. Of the things they have made with their hands and the treasures that they have left us to remember them by. It tells the story of friendships - depicted in college logos, and “Geneva” ornaments - woven tightly throughout the many stages of our lives. Our tree tells these stories, and as we hang the ornaments each year, we share them. …And then sometimes when the kids aren’t looking, I rehang them in a better spot :) The point is that we had fun together and it didn’t require any scheduling or special outfit or really any effort at all other than just being present. And when it's all done, we sit back and read our advent book by the tree’s glow each night as a reminder that while Christmas is a time of great magic and anticipation of what Santa will put under the tree, the real magic began two thousand years ago in a manger in Bethlehem. Thank you, Johanna! I especially LOVE your Christmas card tree. And I, too, am known to spread out the girls' ornaments later - particularly the cluster ring of ornaments hung at three feet high... Happy tree trimming everyone!